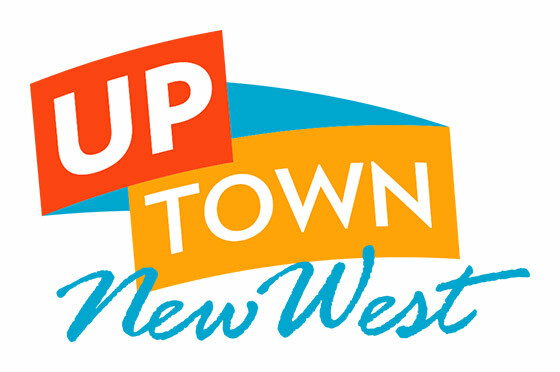 On Saturday, April 22nd from 2-5pm, indie and electronic record labels from across Metro Vancouver will descend upon New Westminster for a day of live music, beer, food and of course crate digging. 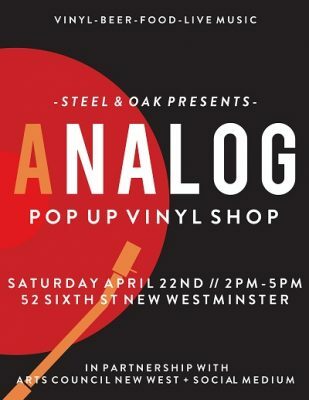 First launched by Steel & Oak Brewing Co. in the fall of 2016, the spring edition of Analog: Pop Up Vinyl Shop will be popping up at 52 6th Street on the corner of Sixth St. and Carnarvon from 2-5 pm in the heart of downtown New West. Joining Steel & Oak and the Arts Council will be Indie Labels Northern Electric, Scrape and File Under: Music. New for this edition will be some of the region’s electronic music labels including; Pacific Rhythm, Normals Welcome, Heart to Heart and Hybridity Records. Music Madhouse Records will also be on hand for those in the mood for some classic releases or a rare press or two. An afternoon of vinyl shopping and sipping craft beer wouldn’t be complete without local music. The Arts Council Stage will feature live performances by Amanda Silvera, Mr. Rust and a DJ spinning some classic hip-hop to close out the afternoon. “We’re super excited for the live performances! Vinyl remains the best way to listen to music and we’re excited to be celebrating that with our pals at Steel & Oak,” says Stephen O’Shea of the Arts Council. Analog: Pop Up Vinyl Shop hits 52 Sixth St. on Record Store Day, April 22nd from 2-5pm. Amanda silvera fits firmly in her own unique category. Her new album, Syncing, is a captivating and moving debut that heralds the arrival of a gifted and significant new talent, one whose music feels familiar in the best possible way, while striking out on its own territory. Born January 12th 1989 in Richmond British Columbia, to hard working jamaican parents (Catherine Silvera) & ( Richard Silvera ) Amanda Silvera adopted prestige traits, characteristics and morals that would soon evolve her into a leader with primal instincts and beliefs of some day influencing the world through her music. Amanda was most comfortable alone often times, she found herself most at peace in the company of music. At home, Amanda’s parents relationship was on the rocks and Amanda’s head phones were her portal and escape from raised voices and scary thoughts. Amanda grew up feeling alienated from the rest of the world in so many ways; her looks were quite distinguishable from her peers, her accent was unique and her cultural roots were looked at as different by most kids her age. Amanda’s true passion springs from writing, in her own words she can “visit other worlds through stories”. Through these tough times amanda turned to her inspiration which at the time derived from her grandmother Tess. No matter the distance between the two, amanda and her grandmother kept communication through letters in forms of stories and poems. Tess was everything that amanda wanted to be when she grew up, an accredited artist writer, teacher, designer, a talk show radio host but most importantly an inspiration to many. Amanda’s grandmother was unfortunately murdered when Amanda was in grade four, the last letter she received from her grandmother said to never give up on her dreams and to give to this world more than one can take from it. These words were held onto dearly and now live through amanda’s actions and persuasion to the achieving her goals and dreams. Shortly after amanda found peace when she joined the choir and met Mrs. Manceneli. The choir brought her closer to understand her true lifes mission; it was the first place where she understood that the voice inside of her needed to be share. During her grade nine year, Amanda’s’ parents divorced, Amanda soon after dropped out of school which kept her available to care for her younger sibling, who was also trying to cope with this change of worlds. rebelling against life as they knew it, so began whirlwind of challenges that would muse most of her songs to come. Amanda created a small recording space at home and soon upgraded to her friends ‘home studio’; this studio consisted of a microphone, a pop block made of her friends mothers stocking, in a closet still filled with clothing that had a doubling purpose of insulating the booth. ; “that closet was my happy place”. This truly became her sanctuary, her home was broken but her dream was whole. Amanda pushed desperately, determined to prove the world wrong, to prove that dreams really do come true. Amanda returned to school the following year, graduating 6 months early and with honors. With school out of the way, and a renewed outlook on life, the pieces began to fall into place for amanda. Entering a wide variety of showcases around her city with acts like Brian Mcknight, Bobby Valentino, Ginuwine, SWV, Tony Toni Tone, Jeremih, and Too Short earned her some much needed exposure and the notoriety to begin playing bigger shows for a highly increasing audience. Still recording continuously, Amanda began to receive requests from abroad to write, record and collaborate. from the UK, to Tokyo Japan. committed to her first solo album which she is proud to called “syncing”. Amanda along with her motivated team of experts put nearly everything they had into creating an album that would be worth sharing but most importantly an album that will move people and connect them through our own reflections of darkness, healing and conquering. Amanda Silvera is beyond ready to introduce a new style r&b & Soul music that far surpasses the expectations of its genre. Her new age approach and incredible looks make her the ideal candidate for just about any show. When you see amanda playing her songs, you will see passion, pain, and true inspiration. She performs her songs precisely the way she’s always wanted, created a fully realized album that is the culmination of where she’s been and where she’s going, and one that is sure to win her notoriety that is demanded by the depth and quality of her music.